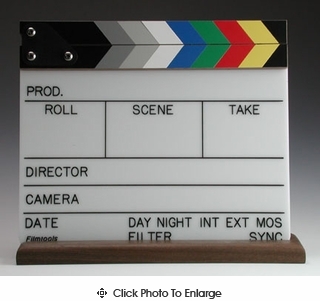 The color sync-slate has hand-laid colored Formica inserts in the clapper sticks. The Engraved slate is the standard sized that will fit into all standard Camera Assistant’s front boxes. We’ve priced this slate to be more affordable. Deminisions:W11″ x H9.5″. Weight: .9 pounds.